UPDATE: With the release of EWG's Tap Water Database, we found an additional 32 million Americans who have been supplied water with chromium-6 contamination. The lawyer sets down the glass and says, "I think this meeting’s over." But almost 25 years after that real-life confrontation, the conflict over chromium-6 is not over. A new EWG analysis of federal data from nationwide drinking water tests shows that the compound contaminates water supplies for more than 200 million Americans in all 50 states. Yet federal regulations are stalled by a chemical industry challenge that could mean no national regulation of a chemical state scientists in California and elsewhere say causes cancer when ingested at even extraordinarily low levels. The standoff is the latest round in a tug-of-war between scientists and advocates who want regulations based strictly on the chemical’s health hazards and industry, political and economic interests who want more relaxed rules based on the cost and feasibility of cleanup. If the industry challenge prevails, it will also extend the Environmental Protection Agency’s record, since the 1996 landmark amendments to the Safe Drinking Water Act, of failing to use its authority to set a national tap water safety standard for any previously unregulated chemical. In 2008, a two-year study by the National Toxicology Program found that drinking water with chromium-6, or hexavalent chromium, caused cancer in laboratory rats and mice. Based on this and other animal studies, in 2010, scientists at the respected and influential California Office of Environmental Health Hazard Assessment concluded that ingestion of tiny amounts of chromium-6 can cause cancer in people, a conclusion affirmed by state scientists in New Jersey and North Carolina. The California scientists set a so-called public health goal of 0.02 parts per billion in tap water, the level that would pose negligible risk over a lifetime of consumption. (A part per billion is about a drop of water in an Olympic-size swimming pool.) But in 2014, after aggressive lobbying by industry and water utilities, state regulators adopted a legal limit 500 times the public health goal. It is the only enforceable drinking water standard at either the state or federal level. Spurred by a groundbreaking 2010 EWG investigation that found chromium-6 in the tap water of 31 cities and a Senate hearing prompted by the findings, the EPA ordered local water utilities to begin the first nationwide tests for the unregulated contaminant. 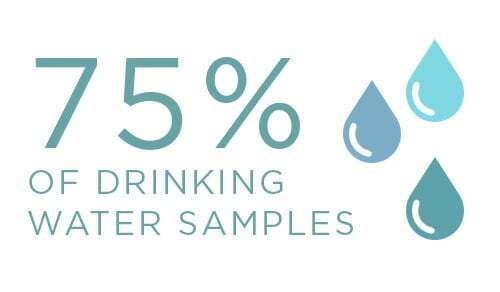 From 2013 to 2015, utilities took more than 60,000 samples of drinking water and found chromium-6 in more than 75 percent of them. 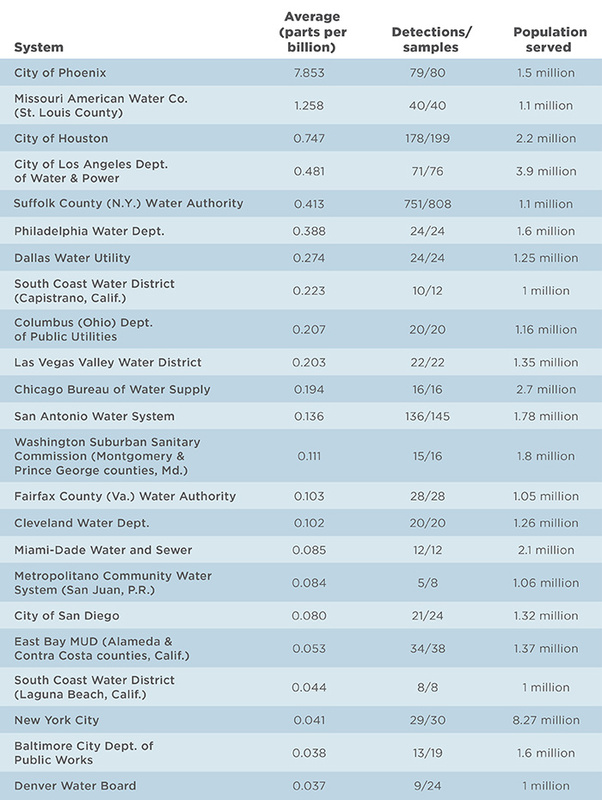 EWG's analysis of the test data estimates that water supplies serving 218 million Americans – more than two-thirds of the population – contain more chromium-6 than the California scientists deemed safe. 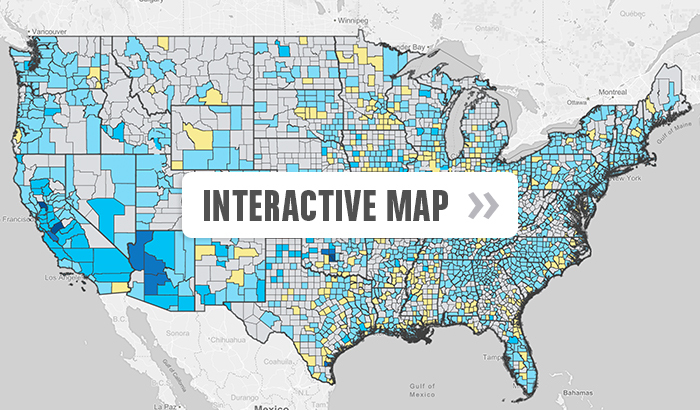 Even by that far-too-lax benchmark, EWG's analysis of EPA tests shows that more than seven million Americans are served tap water from supplies that had at least one detection of chromium-6 higher than the only legal limit in the nation. Because the EPA tests covered only a fraction of the small systems and private wells that supply water to more than a third of Americans, it is highly likely that chromium-6 contamination is even more widespread. The EPA tests show that water tested in 1,370 U.S. counties had an average level of chromium-6 exceeding California's non-binding public health goal – the amount posing no more than a one-in-a-million risk of cancer for people who drink it daily for 70 years. 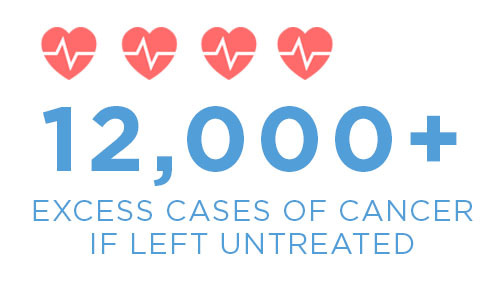 (By contrast, the state's legal limit represents a cancer risk of 500 per million.) 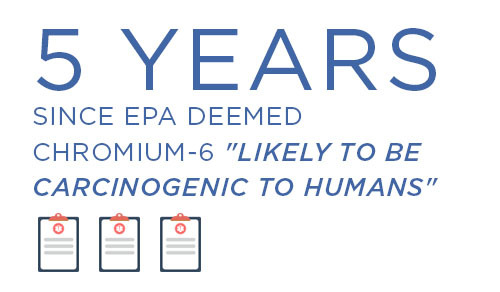 Comparing the public health goal to levels of contamination found in the EPA tests, EWG estimates that if left untreated, chromium-6 in tap water will cause more than 12,000 excess cases of cancer by the end of the century. The tests found chromium-6 in almost 90 percent of the water systems sampled. Oklahoma, Arizona and California had the highest average statewide levels and the greatest shares of detections above California's public health goal. Among major cities, Phoenix had, by far, the highest average level, at almost 400 times the California health goal, and St. Louis and Houston also had comparatively high levels. Scientists in California's Office of Environmental Health Hazard Assessment are not alone in determining that extraordinarily low levels of chromium-6 in drinking water can cause cancer. In 2010, New Jersey's Drinking Water Quality Institute, a state agency comprised of scientists, utility officials and citizen experts, calculated a health-based maximum contaminant level – what California calls a public health goal – of 0.06 parts per billion, just slightly higher than California's. This year, scientists in North Carolina's Department of Environmental Quality, also drawing on the 2008 National Toxicology Program study that drove the California goal, calculated a do-not-drink level matching the New Jersey number. 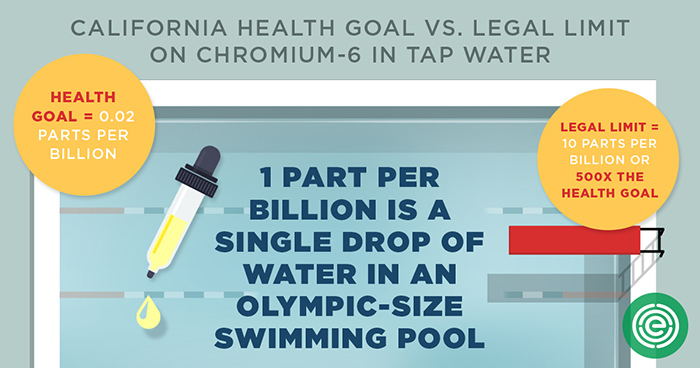 But neither New Jersey nor North Carolina has set a legal limit for chromium-6 in tap water. In both states, scientists' health-based recommendations were at odds with the decisions of politically appointed regulators. In New Jersey, the press reported the water quality institute's recommendation before it could be formally submitted to the Department of Environmental Protection for development of a regulation. According to former DEP planner Bill Wolfe, now an environmental advocate, this angered Department of Environmental Protection Commissioner Bob Martin, appointed by Gov. Chris Christie. Wolfe said Martin not only blocked submission of the recommendation, but effectively stopped the institute from meeting for four years, delaying drinking water regulations for more than a dozen chemicals. In a statement to EWG, a Department of Environmental Protection spokesman said the department "vehemently disagrees with the EWG's contention that political pressure in any way influenced the New Jersey Drinking Water Quality Institute's consideration of an MCL for chromium-6." The spokesman said EWG's characterization is based on the "opinion of a single, former NJDEP employee who was last employed by the agency 12 years ago," and that EWG's criticism is "critically flawed – and blatantly misleading." In North Carolina, scientists at the Department of Environmental Quality were alarmed by levels of chromium-6 in hundreds of private wells near unlined pits where Duke Energy dumped coal ash. The scientists warned well owners not to drink water with chromium-6 levels higher than their calculations found were safe. But higher-ups at the department rescinded the do-not-drink warnings, citing the lack of federal regulation as justification for telling well owners their water met all state and federal standards. The conflict over chromium-6 regulation stems not only from the question of how much is safe, but the staggering cost of cleaning up such a widespread contaminant that is an industrial pollutant but also occurs naturally. The California Department of Public Health estimates that treating the state's water to meet the legal limit of 10 parts per billion will cost nearly $20 million a year, so the cost of meeting the much more stringent public health goal would be far higher. There are two main types of chromium compounds. Chromium-3, or trivalent chromium, is a naturally occurring compound and an essential human nutrient. Chromium-6 also occurs naturally, but is manufactured for use in steel making, chrome plating, manufacturing dyes and pigments, preserving leather and wood and, as in the Brockovich case, lowering the temperature of water in the cooling towers of electrical power plants. Chromium-6 is also in the ash from coal-burning power plants, which is typically dumped in unlined pits that a 2011 report by the nonprofit Earthjustice said may threaten hundreds or thousands of water supplies and private wells. And recent research has suggested that some methods of treating water supplies to remove other contaminants may actually increase levels of chromium-6. Human studies by government and independent scientists worldwide have definitively established that breathing airborne chromium-6 particles can cause lung cancer, and the U.S. Occupational Safety and Health Administration sets strict limits for airborne chromium-6 in the workplace. Whether inhaled or ingested, it can also cause liver damage, reproductive problems and developmental harm. Studies have found that exposure to chromium-6 may present greater risks to certain groups, including infants and children, people who take antacids, and people with poorly functioning livers. But because of the unsettled science – including the crucial question of how much chromium-6 the stomach converts into mostly harmless chromium-3 – the EPA has only set a drinking water limit for total chromium, the combined level for both compounds. That outdated regulation from 2001, based on skin rash concerns, is 100 parts per billion – 5,000 times California's public health goal for chromium-6 and 10 times the state's legal limit. After Brockovich uncovered chromium-6 pollution in Hinkley, residents filed a class-action lawsuit that Pacific Gas and Electric Company, or PG&E, settled in 1996 for a record $333 million. The case pushed California legislators to pass a law calling for regulators to set an enforceable drinking water standard. The law set a 2004 deadline for the regulation, but it was delayed by a PG&E-backed scheme. In 2001, as state scientists conducted a risk assessment to guide the regulation, an epidemiologist named Jay Beaumont noticed something fishy. A Chinese scientist had revised a key study of chromium-6 in drinking water, reversing his original finding of a strong link to stomach cancer. Some members of a "blue-ribbon" panel advising the state cited the revised study as evidence against a strong regulation. But when Beaumont tried to find out why the scientist had changed his mind, it turned out he was dead. Beaumont learned that the study was rewritten not by the original author, but by consultants hired by PG&E to help defend the Brockovich case. Before the Chinese scientist died, they paid him a token amount for access to his original data, manipulated it to hide the link to stomach cancer, and published the revised study in a scientific journal without disclosing their or PG&E's involvement. What's more, the advisory panel included the head of the consulting firm, Dennis Paustenbach of San Francisco-based ChemRisk, who was once described in a Newark Star-Ledger investigation of his role in weakening New Jersey chromium regulations as having “rarely met a chemical he didn’t like.” A 2013 investigation by the nonprofit Center for Public Integrity found that Paustenbach and other ChemRisk employees also worked for General Electric, Lockheed Martin and Merck, all companies with liability for chromium pollution, and the Chrome Coalition, an industry lobbying group. After his role in tampering with the Chinese study was exposed, Paustenbach resigned from the advisory panel. Beaumont and his colleagues started over, using the authentic study to guide the public health goal. In 2005, EWG obtained and published documents and emails that detailed the deception, which was also recounted in a front-page story in The Wall Street Journal. The scientific journal that published the bogus study retracted it. In 2010, in the first-ever tests for chromium-6 in U.S. tap water, EWG found the chemical in 31 of 35 cities, with water in 25 cities containing levels above the California public health goal. The worst contamination was in Norman, Okla., where the level was 600 times the public health goal. Levels in Honolulu, Hawaii; Riverside and San Jose, Calif.; Madison, Wis.; and Tallahassee, Fla., ranged from 100 to 62 times the California health goal. Sources of the contamination are largely unknown, although Oklahoma and California have high levels of naturally occurring chromium and California has the nation’s highest concentration of industrial sites that use chromium. EWG’s tests and a petition from environmental groups pushed the EPA to add chromium-6 to the chemicals for which local utilities must test under the Unregulated Contaminant Monitoring Rule. 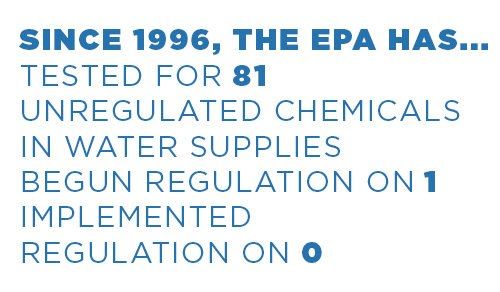 The 1996 amendments to the Safe Drinking Water Act require the EPA to select up to 30 previously unregulated contaminants for testing every five years. In 20 years, the agency has ordered testing for 81 contaminants, but has moved forward on setting a regulation for just one, the rocket fuel ingredient perchlorate, and is two years behind schedule on finalizing and implementing the regulation. For our analysis, EWG matched the Unregulated Contaminant Monitoring Rule database with the federal Safe Drinking Water Information System to obtain county and population data. Population calculations for each utility were based on EPA data, and when projected to the county or state level, EWG used the U.S. Census Bureau estimates from July 2014. The EPA results match EWG’s 2010 tests closely, with exceptions such as Phoenix and Scottsdale, Ariz., and Albuquerque, N.M., where the EPA tests detected significantly higher levels of chromium-6. The EPA results identify several communities where levels of chromium-6 are strikingly higher than those in the surrounding state, but determining whether this is because of industrial pollution or natural occurrences would require site-by-site investigation. The American Chemistry Council, the chemical industry's powerful lobbying arm, argued that before formally releasing the draft for public comment, the EPA should wait for the publication of studies funded by the Council and the Electric Power Research Institute on the biological mechanisms through which chromium-6 triggers cancer. In an April 2011 letter obtained by the Center for Public Integrity, Vincent Cogliano, acting director of IRIS, responded to the chemistry lobby that "granting your request could entail a delay of unknown duration with no public discussion or review of the strong new studies that are now available." An external review panel, which the Center for Public Integrity later found included three members who consulted for PG&E in the Brockovich case, pressured the EPA to grant the American Chemistry Council's request. In 2012, the EPA quietly announced that the draft risk assessment will be held up until the chemical lobby's studies are finished. EWG and other public health groups objected vociferously, not only due to the delay on chromium-6 but "the dangerous precedent suggested by delaying risk assessment activities to allow incorporation of as-yet unpublished, industry-funded research." The EPA's prediction of when the risk assessment will be released for public comment has been pushed back repeatedly – from 2015 to the second quarter of 2016, and then to early 2017. When asked for an update, Cogliano wrote in an Aug. 24 email to EWG: "We expect to release a draft health assessment document in 2017, though I wouldn't use the word 'early.'" Also on Aug. 24, an EPA spokesperson wrote in an email to EWG that the agency "has not made any decision regarding revising the drinking water regulations for [total] chromium or establishing regulations for hexavalent chromium." That's troubling, as the industry studies are expected to support the position that the EPA should do nothing at all. The industry-funded studies are being conducted by ToxStrategies, a Texas-based science-for-hire consulting firm. The Center for Public Integrity found that a principal scientist at ToxStrategies, Mark Harris, had worked on the PG&E-funded scheme to revise the Chinese scientist's paper linking chromium-6 to stomach cancer while at ChemRisk. The Center reported that Harris and his ToxStrategies colleague Deborah Proctor previously "were leaders in the chrome industry's efforts to dissuade the Occupational Safety and Health Administration from setting stricter rules for airborne chromium in the workplace." In June, the Texas Commission on Environmental Quality released a proposal for a daily safe dose of chromium-6 in drinking water that drew heavily on studies by Proctor and other ToxStrategies scientists. It argues that the EPA's current legal limit for total chromium – 100 parts per billion, with no separate limit on chromium-6 – is adequate to protect public health. Joseph T. Haney Jr., the Texas state toxicologist who was the lead author of the paper, told the newsletter Inside EPA it was "a remarkable coincidence" that his calculations yielded a daily safe dose corresponding exactly to the EPA's current regulation for total chromium. Haney's paper assumes there is a threshold for how much of a contaminant is harmful, and that no level of chromium-6 the EPA tests found in U.S. drinking water exceeded that amount. But the so-called linear method the EPA generally requires for mutagens – carcinogenic chemicals that cause cancer by damaging DNA, which can occur when even a single molecule enters a cell – assumes that any level of exposure carries some risk. The National Toxicology Program's 2008 two-year study of lab animals found clear evidence that chromium-6 causes cancer, and the EPA's 2010 draft risk assessment found that it is a powerful mutagen, so the linear method should be used to calculate cancer risk. The ToxStrategies model rejects the EPA's finding that chromium-6 causes cancer by damaging DNA, instead arguing that it causes hyperplasia, an increase in the number of cells, which may or may not be cancerous. It is based on a 90-day animal exposure study, in contrast to the more rigorous two-year National Toxicology Program study. It also ignores the growing body of independent research exploring the effects of small doses of carcinogens in combination with the myriad other cancer-causing chemicals Americans are exposed to daily. If the EPA accepts the ToxStrategies threshold model, it could mean not only that chromium-6 will remain unregulated in drinking water, but also set a precedent that could undermine health protections for other carcinogenic chemicals. The EPA must reject the industry-backed effort, which is supported not by unbiased science to protect health, but by agenda-driven research to protect polluters from paying cleanup costs. The recent conflict in North Carolina is one example of how the EPA's failure to set enforceable national regulations is leaving Americans at risk from chromium-6 contamination. The result is not just an unsettled scientific debate, but the exposure of hundreds of millions of people to a cancer-causing chemical in their drinking water. Cleaning up water supplies contaminated with chromium-6 will not be cheap. But the answer to high costs is not allowing exposures at unsafe levels while pretending water is safe. 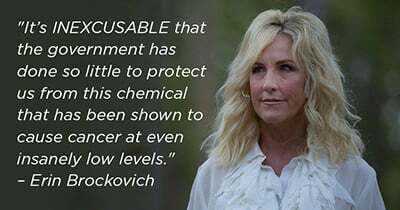 And the fact that some unknown level of chromium-6 contamination comes from natural sources does not negate Americans’ need to be protected from a known carcinogen. Instead, the EPA and state regulators must set drinking water standards to protect the public, including those more susceptible to the toxic effects of chromium-6. Chromium-6 polluters must be held accountable and pay their shares of cleanup costs. The EPA and state regulators must focus on ensuring that water systems lacking the resources to meet health-protective standards have access to necessary funding, expertise and support so they can provide communities with truly safe water. This report has been updated to include a response from the New Jersey Department of Environmental Protection to allegations that political interference blocked development of a chromium-6 drinking water standard. 1 In the film the exchange takes place in a law firm’s conference room, but it was actually in a courtroom. 11 Excess cancers were calculated by dividing the average chromium-6 level in each state by the California public health goal of 0.02 ppb, which the state's Office of Environmental Health Hazard Assessment said represents a one-in-a-million risk of cancer if consumed daily for 70 years. This value was then multiplied by the state's 2014 population according to the Census Bureau, then linearly scaled to the 84 years until the end of the 21st century. These estimates assume an equal distribution of chromium-6 across each state, that all residents consume two liters of unfiltered water daily and that the population and hexavalent chromium levels will remain constant until the year 2100. 14 In their initial draft, California scientists set a public health goal of 0.06 parts per billion, the same number later calculated by scientists in New Jersey and North Carolina, but after reviewing more studies lowered it to 0.02 parts per billion. 15 Personal communication to EWG from Bill Wolfe, former policy analyst for the New Jersey Department of Environmental Protection, Aug. 25, 2016. Wolfe spoke at the news conference to announce the Drinking Water Quality Institute's health-based maximum contaminant level for chromium-6 in drinking water. 26 Testimony in a trial of PG&E for chromium-6 pollution in other California communities indicates the amount was $1,960. 44 Email from Cogliano, Aug. 24, 2016. 45 Email from Enesta Jones, EPA Office of Media Relations, Aug. 24, 2016. 48 Maria Hegstad, Inside EPA, op. cit.